The Village Voice eNewsletter is provided as a service of the Village of Vernon Hills. This eNewsletter is distributed approximately once each month. You may manage your subscription at the bottom of the page. Please direct your comments to Social@vhills.org. 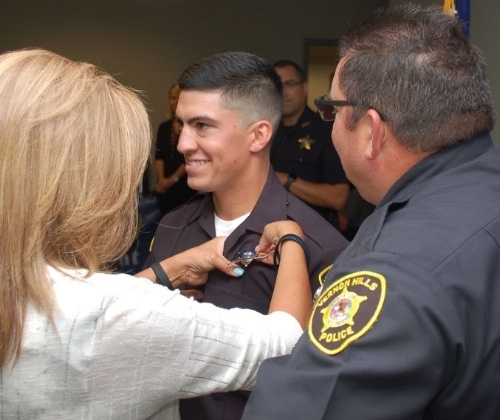 The Vernon Hills Police Department continues to investigate a series of residential burglaries that occurred in three subdivisions in the early morning hours of September 23. Two incidents occurred in the Centennial Crossing subdivision on Rt. 45. Three occurred in the Stone Fence Farm subdivision, and one in the Hawthorn Club subdivision. The police investigation of these crimes indicated that at five of the homes the offender entered through an unlocked sliding door. In one case it is believed that entry was gained through an unlocked garage service door and then through the unlocked door leading into the home. In every case the residents were home asleep at the time. No resident was confronted or injured in any of the incidents. The items taken included purses, wallets and/or other personal items that were near the door. Police remind everyone to be diligent about checking all doors and windows before going to bed. Police also recommend the use of exterior lighting on all doors. Consider using timers, motion detectors, and light bulbs/fixtures with dusk-to-dawn technology. The accompanying image was taken from a residential security camera. If you have any information that can assist investigators, please call the Vernon Hills Police Department at 847-247-4883. And please take time to lock your homes and your cars. 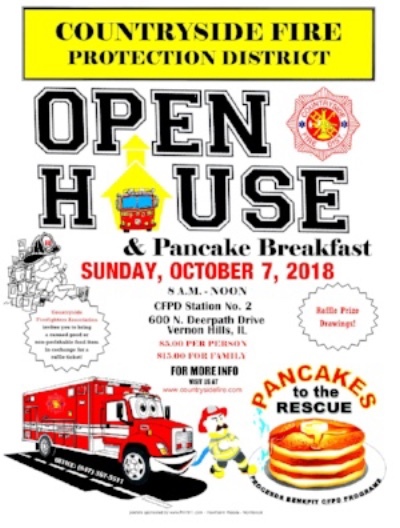 Sunday, October 7 from 8 a.m. to noon at Countryside Fire Station, 600 N. Deerpath Drive. Fun for the whole family at Countryside's annual Open House. Activities, give aways and plenty of photo opportunities. Enjoy a delicious pancake breakfast – only $5 per person or $15 per family, with proceeds supporting local charities and equipment purchases. Serving from 8 a.m. to noon. Visit CFPD's Facebook page for updates. Sunday, October 7 from 1 to 4 p.m. at Mellody Farm, on northeast corner of Route 60 and Milwaukee Avenue. 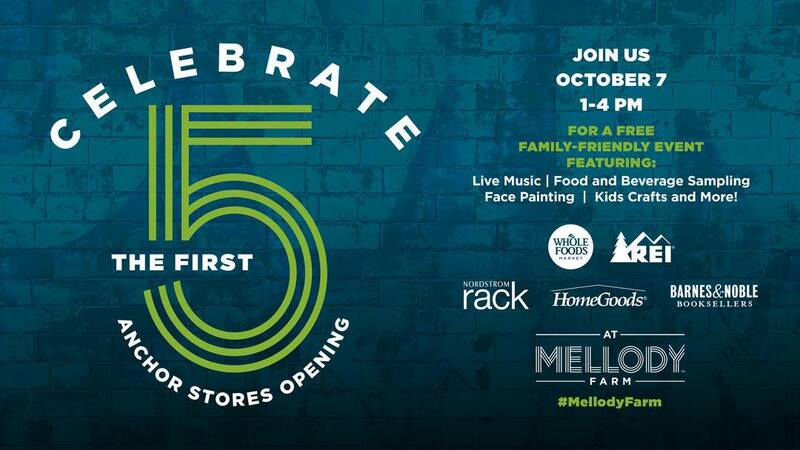 Regency Centers celebrates the opening of the first five major retailers in the new Mellody Farm center. Music, crafts, refreshments and more in the center plaza and at the five anchor stores – Whole Foods, REI, HomeGoods, Nordstrom Rack, and Barnes & Noble. More info on the Celebrate the First 5 Facebook page. Please use great caution when traveling through the neighborhoods at this time – go slow and stay off the phone, please. If you would like to participate, please turn on your outside lights. Parents/Guardians – Please accompany your children and check their treats before enjoying – discard unwrapped items, fruit, baked goods and the like unless you are extremely familiar with the giver. Children – Do not enter a home or accept a ride, unless it is from a known individual. Stay with your group and stay in your known neighborhood. 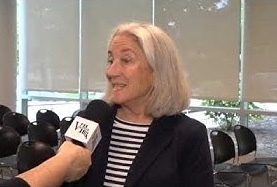 More tips are available on the VHPD website as well as on the October 2018 Vernon Hills Update Cable/Web Show. Residents interested in running for one of three 4-year Village Trustee positions that will appear on the April 2, 2019 Consolidated Election ballot may obtain candidate packets from the Village of Vernon Hills Clerk’s Office. Information may also be downloaded from the Village website. Petitions were open for circulation for signatures beginning September 18. The first day to file completed nomination papers is December 10, and all packets must be filed by 5 p.m. on December 17 to be included on the April 2 ballot. Petitions for Vernon Hills Trustee will be filed at Village Hall; petition packets for other positions will be filed directly with each organization fielding positions. More information, including an Illinois State Board of Elections Candidate's Guide, is available on the Vernon Hills website as well as from the Lake County Clerk. You may also contact Vernon Hills Village Manager/Clerk Mark Fleischhauer at 847-918-3550 or mfleischhauer@vhills.org. Visit Voter Power to check your registration status, poll location and specific ballot assigned to your address. Voting on Election Day, November 6, is available at a specific polling place assigned to your address from 6 a.m. to 7 p.m. Early Voting is now available at several sites around the County. Voting by Mail is another convenient option for casting your ballot. Register to Vote in several ways, including on-line, in person, and at Early Voting sites. You may also register on November 6 (Election Day) at the polling place assigned to your address – your ballot will be held a short time until proper identification is provided. Remember, if you have a change in name or address, you will need to re-register. Registration requires documents showing proof of identification and residence. The October 2018 Vernon Hills Update includes a Voting Info segment. 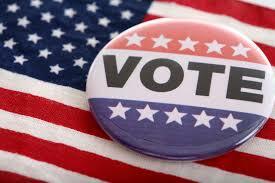 More information is available through the Lake County Illinois Clerk's Office Voter Services webpage. Please note that the next Village Board meetings will be held on Wednesday, October 17 and Wednesday, November 7, instead of on the usual Tuesday schedule. The full Meeting Schedule is available on the Meeting Schedules webpage. Meetings begin at 7 p.m. and are held at Village Hall, 290 Evergreen Drive at Route 45 unless otherwise noted. Residents are encouraged to attend meetings, as well as view them on the Village YouTube Channel and on Cable Access. Agendas and minutes are posted online. Milkcow has opened in Hawthorn Village Commons near Hobby Lobby. October 2018 program includes information on how to vote in the November election, Halloween safety suggestions, Fire Safety Month (including a reminder to visit Countryside Fire for Pancakes on Sunday, October 7), another look at the recent historical marker designation, and scenes from Vernon Hills Oktoberfest. See all of the shows on the Vernon Hills Update YouTube channel. 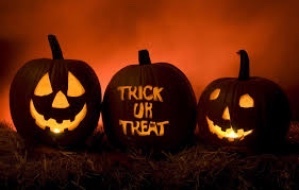 TRICK OR TREAT TIME – Oct. 31 from 4 to 8 p.m.
American Legion Bingo Fundraiser – Nov. 1 from 6 to 11 p.m. at Vernon Hills Golf Course Clubhouse, 291 Evergreen Drive. GENERAL ELECTION – Tuesday, Nov. 6. Information about voter registration, voting options, polling sites and ballot contents is available from the Lake County IL County Clerk's Voter Services webpages. Village Tree/Menorah Lighting – Saturday, Nov. 24 at 4:30 p.m. at Vernon Hills Golf Course, 291 Evergreen Drive. American Legion Bingo Fundraiser – Dec. 7 from 6 to 11 p.m. at Vernon Hills Golf Course Clubhouse, 291 Evergreen Drive. 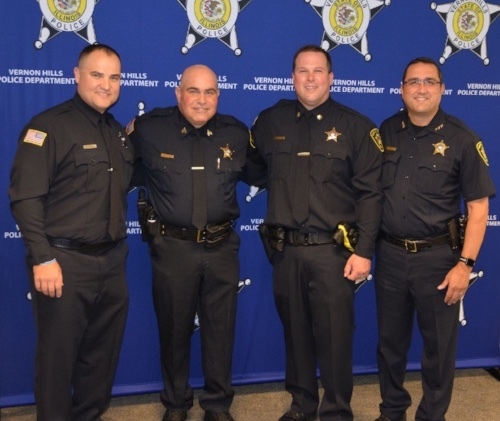 Above left: New VHPD Officer William Ershen, newly promoted Sergeant Mike Katzenstein, newly promoted Commander Shannon Holubetz, and Chief Patrick Kreis. Above right: New Officer Grant Smith with parents Helen Smith and Officer Don Smith. 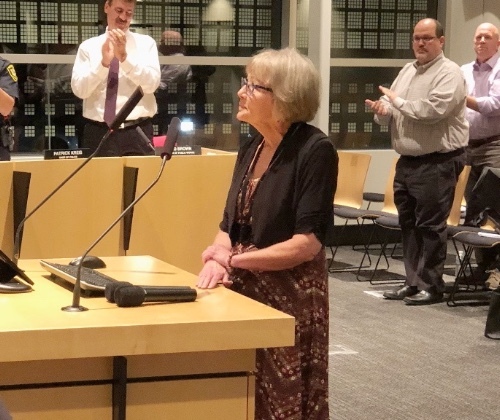 Above left: Trustees honor long-time Village Staffer Lynn DeAnda as she prepares to retire. 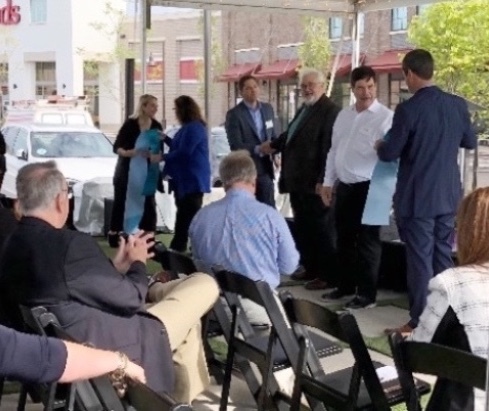 Above right: Mayor Roger Byrne joins with representatives of Regency Center for the official ribbon cutting at Mellody Farm. As they do each October, many VHPD officers will be wearing pink during the month of October to bring attention to National Breast Cancer Awareness Month. 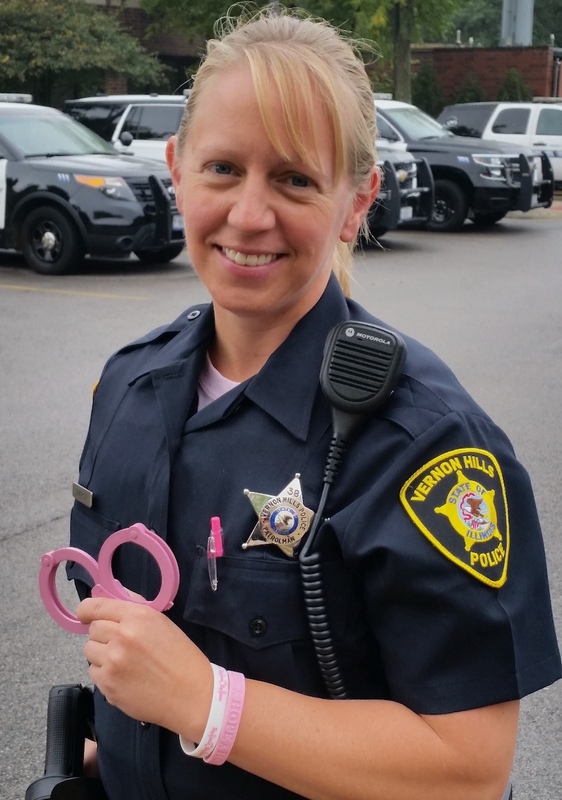 Check out Officer Stacy Seversen's pink handcuffs. Thank you all for reading. Suggestions? Questions? 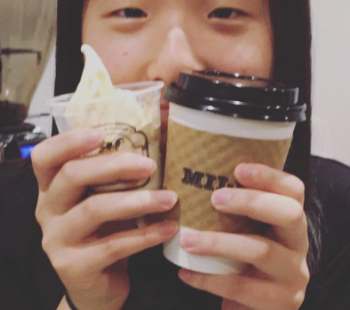 Copyright © 2018 Village of Vernon Hills, All rights reserved.